· Beatha Aodha Ruaidh "Aodh Ó Domhnaill do beith i nGlionn Mhaoilugra"
· Beatha Aodha Ruaidh "go Gleand Maoilugra bail i raibe Fiacha m Oedha"
· Stair an Bhionadaigh, 191 Agus 'Ghlean-Maluire [gin.]' 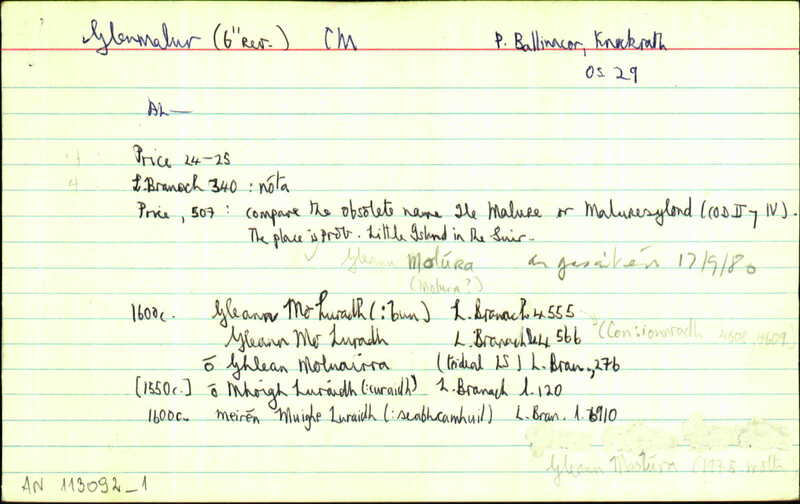 san áit chéanna aige le haghaidh Clann Mhaoilíora (#1403509) (UF/La/CD). Glenmalure, c. Wick., Ci. ; ¶ G. Maoilughra, Mi. ; ¶ Glendaloure, stronghold of the O Tooles in 1539, letter of Lord Gray to Cromwell. G[lenn]. maoilughra Glenmalure, c. Wick., Ar. 22, Fm. vi. 1916; ¶ G. Molura, Ci. G[lenn]. 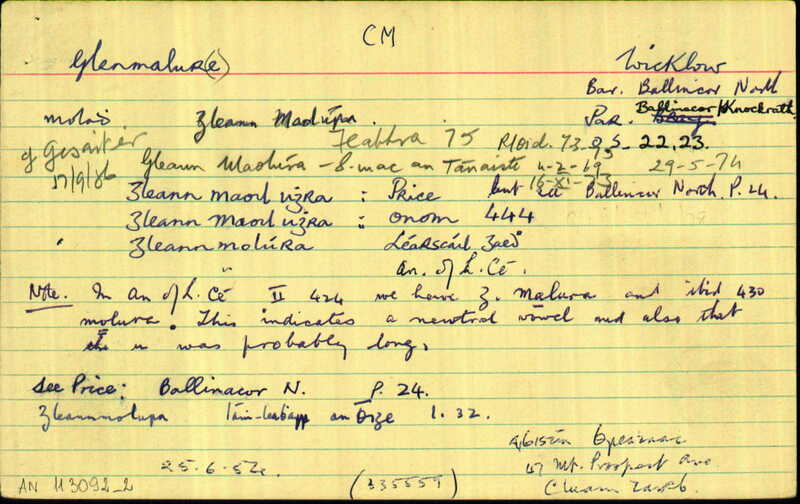 malura Glenmalure, c. Wick., Ci. ; ¶ G. Maoilughra, Mi. ; ¶ Glendaloure, stronghold of the O Tooles in 1539, letter of Lord Gray to Cromwell.